All weekends are vital in the 4NCL but none more than the final matches where every single game has the potential to change the outcome of the whole season. Our start in the demotion pool of division 2 had given encouragement in what appeared, on form, a dog fight between Barbican Youth, Rhyfelwyr Essyllwg and ourselves to avoid the last relegation slot [KJCA Kings with 2 points, e2-e4 2nd team and North-East England each with 0 points looked doomed; whilst The ADs and Poisoned Pawns with 8 and 7 points respectively looked safe]. We were playing the ADs on the Saturday in round 9 and that appeared our toughest fixture, many expecting them to finish with 100% in the relegation pool. Thereafter we were due to play North-East England on Sunday and KJCA Kings on Monday. After the Saturday games the whole complexion of the pool had changed following a sensational 6-2 victory by KJCA Kings over Poisoned Pawns. These young Kent players clearly had not given up the fight, and, with other results going as anticipated, the relegation danger list had suddenly increased to any two from five: North-East England and e2-e4 doomed , The ADs safe and everyone else playing for their Division 2 lives. Our match with the ADs looked pretty balanced for much of the time and out of the opening phase we might even have felt to have an edge. Gradually, things turned against us and we lost 3 matches and drew the rest for a score line that was perhaps fair even though we were aware that we had missed opportunities. 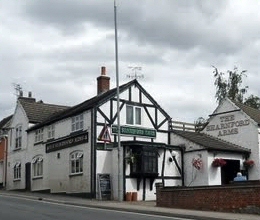 Saturday evening saw us at the familiar hunting ground of Rossini's in Hinckley and we were able to relax even more vigorously than usual with the prospect [unique to the gap between rounds 9 and 10 ] of a lie-in on the following morning. Thus the evening out saw the customary blend of excellent food, drink and sophisticated discussion and the return to Hinckley Island saw a good turnout for the traditional nightcap. Sunday's round of matches would give us a clear view of what we needed to do in what promised to be an exciting and tense finale but we had to concentrate on beating North-East England to try to take some of the tension out of that last round. So far as the match went we scored the necessary win but as in our defeat by the ADs the North-East team could rightly claim that until pretty late on they were well in contention. The pick of our wins came in quick-fire style from Andy Smith making a welcome return to our line-up and this put us in good heart. 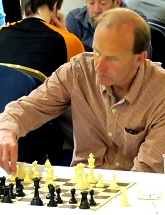 It was not the first result of the match however; a draw offer came to Dave Latham after just 6 moves. Dave consulted with his captain [me] and decided he was happy with a draw with the black pieces and so the deal was done. What was the reason for the offer I hear you say? Perfectly simple: Just before the match opponent Ray Sayers had heard tragic news from home: the family guinea pig had died suddenly and the children were inconsolable. Ray's wife demanded his immediate presence back home or she was going to hit him with a frying pan [I may have made that bit up]. This information was readily given by Ray to Dave, who, perhaps feeling empathy with the domestic bliss inherent in this tale, and having finished so early, decided after a couple of hours watching the match that he would nip up to Wigan and bring his wife [and prominent Spirit of Atticus supporter] Jeannie, down for the remainder of the weekend. So deeply was he affected that Dave forgot to tell anyone he was going; so shambolic was our departure to the Sharnford Arms in the picturesque neighbouring village of Sharnford that it was only on our arrival for the scheduled Chinese meal that we realised that Dave was missing. Obviously we were very worried but after a swift search of the hotel we put our worries behind us. I digress; our other victories came from our highest % scorer of the season, Martin, and from Dave Robertson. Martin's win came after he faced some pressure from the opening, broke out when his chance came and converted to an easily won ending. Dave had a pleasant edge from the opening which had almost dissipated, but playing at high tempo Dave kept the pressure on and eventually broke through in the rook ending. Our one loss was a good game between the two women in the match; Sheila was playing Sue Mororoa who seized the initiative and emerged victorious after a long struggle. This was not to be the last time over the weekend that the younger player scored the full point. And so back to our Chinese meal: this was our third season in the 4NCL and for the first time we did not know at this stage [i.e. after round 10] if we had been successful in our season's objective. Nonetheless Entertainment Secretary Dave Robertson made his by now traditional toasts to various members of our group who had caught his eye over the season and by supplying ample wine [another excellent tradition, cheers Dave!] for said toasts and indeed for much of the evening. 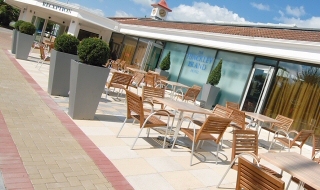 The food and service proved to be most acceptable and we returned to base replete. There was a brief, delirious reunion with Dave and the newly arrived Jeannie but perhaps with the morrow in mind only a small contingent required the bar. There are over a season many crunch matches: we knew that this was the the biggest crunch of all. Figures hastily compiled on the back of a Nicorette packet in the Sharnford Arms on the previous evening indicated that we would be safe with a victory and had a good chance of safety with a draw. Round 10 had seen an impressive win by Rhyfelwyr Essyllwg against the ADs and a very strong Barbican Youth line-up had been held by Poisoned Pawns who rallied well after their mauling in the Saturday match. These results had muddied the waters even more from our perspective. The possibility of a loss did not even arise in our discussions but it transpired that there was a slender chance of survival even in defeat. The ther games in the final round saw Poisoned Pawns take on The ADs, Rhyfelwyr Essyllwg versus a further strengthened Barbican Youth team and the fiercely contested battle of the basement between e2-e4 2 and North-East England. The match started badly for us with a phone default on board 5 within the first 10 minutes. This did not affect the determination of our team but it did affect the mindset of some players who were even more determined to make a real difference. Thus Nick on board 1 and Peter on board 6 independently decided that it was S or B time [Editor's note: Sonneborn or Berger] . Nick's decision created a position of rare mayhem but he missed an opportunity to keep everything really murky. This omission was exploited by opponent Victor Jones, who with sustained accuracy, brought in an impressive win completing his 3/3 for the weekend. Peter grabbed material and had fast running pawns: he kept his nerve admirably as his opponent's desperate counters opened up Peter's king position and after threading his way through the complications, was rewarded with a deserved win. This was to be our solitary victory of the match but every board was hard fought. I missed several reasonably straightforward wins around the first time control but opponent Saravanan Sathyanandha's [yes, you're right there is an Anand in there] analysed accurately to escape my attempted mating net and then gave me an uncomfortable hour as I had to scramble to save the draw. Sheila on board 4 got some initiative which she carried into the ending but she could do nothing to avoid the inescapable logic of a drawn bishop of opposite colours endgame. Andy Mort on board 7 appeared to have an opening edge but his opponent hung in and soon both players were pushing for an attempted win. Peace was agreed when both sides were about to run out of material. Martin on board 3, our most consistent performer and gatherer of points, fell to defeat after another fine game by a young KJCA player: Martin's mistake was not obvious but opponent William Jones produced a fine strategic game where an opening edge led to middlegame pressure which led to material advantage and a straightforward endgame win. 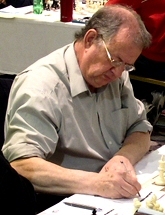 Last to finish, also in defeat, was Dave Robertson who was under pressure after coming out worse from a queenside skirmish early in the middlegame. Dave kept managing to postpone the apparently inevitable but his young opponent Yasmin Giles held her nerve, kept her concentration and put the seal on a fine victory for KJCA Kings sufficient for them to complete the great escape and condemn Poisoned Pawns, who put up a great fight in the last round, and ourselves to the drop. We were most impressed with KJCA's skill, composure and togetherness and have no complaints about the result of our match. This notwithstanding we were shaken by the outcome of our season. To describe our emotions fully we need to transport ourselves to the football scene of the 1970s. Coincidentally it was then that three of the team picked up their football-style nicknames [I refer to Robbo, Jacko and Carlo, all part of the Atticus National Clubs winning squad during that decade]. Yes, relegation meant we were as sick as a parrot [amazingly the parrot could take on the mantle of a collective noun in those wonderful days of old]. Congratulations to Wessex who like KJCA were promoted last year and managed to stay up [not easy, every step up a league tends to be an enormous one]. Wessex used a highly recommended method of staying up: they made it to the promotion pool. 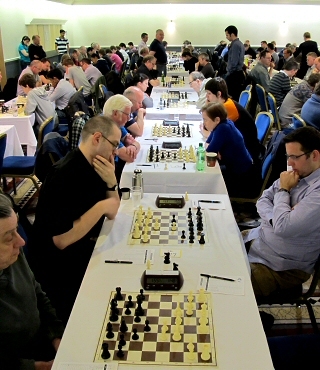 The playing rooms at Puma Hotel Hinckley Island are ideal for 6-8 board division 1, 2 and 3 matches. The last round tension of our pool was repeated all over the divisions and subdivisions and we were delighted to be part of it. We are already looking forward to life back at our roots in the Northern League [briefly we hope] where we will resume some old rivalries and the relatively new one with North-East England. Commiserations to fellow Northerners Cheddleton 2 who missed promotion by the narrowest of margins and congratulations to Bradford DCA Knights A who made it back to the second division. Blowing the trumpet of the Northern League is easy; the venues are of the same excellent standard as those further south but the spaciousness of the playing accommodation is an added luxury. If your team is predominantly composed of northern players and you play in the 3rd Division South then give serious thought to joining us; if you are club based in the North contemplating joining us, do it; you will be over the moon [Oops! back to the 1970's again]. The 4NCL remains the greatest show in the land; we thank the Management Board, led by the incomparable Mike Truran, for their clarity of vision and the army of workers who translate that vision into actuality.